Leon Douglas leans on a car in the parking lot of a McDonald’s on 35th and Juneau. 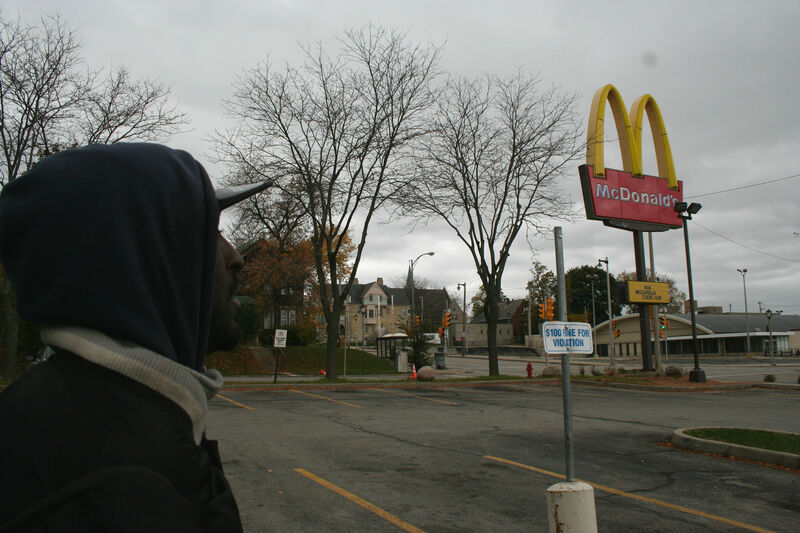 Douglas, who’s homeless and had been canvassing the outside of the establishment hoping for some charity, scarfs down a cheeseburger, with one still waiting in the bag; an order of fries and a large Sprite sit on the sidelines. Douglas says he loved reading, something he “pretty much” taught himself — he would spell words out wherever he went. He was also popular, “The most popular dude in school,” he says. “‘Doin’ me’ consisted of … just applyin’ myself in any area that would be beneficial. Took a lot of chances,” he says. “There is a great part of society that’s a victim to circumstances. The rich keep gettin’ richer, and the poor keep gettin’ poorer,” Leon says. He’s stolen some cars, in addition to the drugs, but Douglas says he’s “been pinned to a lot of other things, too,” such as robberies and burglaries. It’s not that Douglas is lazy, maybe it’s just that he doesn’t see any light at the end of the tunnel. What he does see is greed — what he calls “man’s biggest problem” — and its result. Did you find value in Leon’s story? If so, please subscribe to our newsletter; we publish the story of a different Milwaukeean every week.